When you arrive for your surgery at Tennessee Valley Eye Center, please park in any available space in the front of the building. Once in the building, take the elevator to the second floor lobby and check in at the registration desk. On the day of your surgery an adult family member or companion must accompany you. Your family member or companion has a vital supporting role and must check in at the registration desk in the second floor lobby and remain on the premises for the duration of your procedure. After your procedure, your surgeon or nurses will speak to you and your family member or companion in the surgery lobby or in the recovery room regarding your recovery. In order to ensure your safety after your procedure, your family member or companion must remain on the premises until you are discharged following surgery and must drive you home. If your driver is unable to meet these expectations, your surgery will be cancelled. In the pre-operative area, an intravenous needle (IV) will be inserted in a vein in your arm or hand. This IV will be used for giving medications and fluids that you may need during surgery. You may be given medications to help you relax or antibiotics to help prevent infections. Eye drops may be used to dilate your pupil, to prevent infections, and to numb your eye. The nurse will place a surgical cap on your head before you go to surgery and hook up a device to a monitor your vital signs. Most patients are in the pre-operative area for about 60 to 90 minutes. Take heart medications, blood pressure medications, seizure medications, breathing and stomach medications the morning prior to surgery with only enough water to swallow your pills. Wear loose, comfortable clothing. Shirts should button up the front or be easy to open. If you currently use a blood thinner, your surgeon will instruct you whether or not to discontinue it prior to the day of surgery. TVEC defers to the surgeon’s discretion and requests you speak directly with the surgeon or surgeon’s office staff. Bathe/shower and brush your teeth at home. This reduces the chance of infection. Wear loose comfortable clothing, with a shirt that buttons in front. Except for some procedures you will keep your clothing on during surgery. Wear slip-on flat-sole shoes, to be easily removed. Bring your glasses and/or contact lens case. Wear your hearing aides. Bring check or credit card for co-insurance/deductible. Please leave all other valuables at home. Any questions regarding your eye drops should be directed to your surgeon’s office. What shouldn't I do before my surgery? Do NOT eat or drink anything, including water, after midnight the evening of your surgery. An anesthesiologist will talk with you the morning of your surgery. Do NOT use any tobacco products after midnight the night before your surgery. Do NOT take insulin or oral diabetic medications the morning of surgery. Do NOT take any medication your surgeon has instructed you to discontinue for your surgery. Do NOT wear jewelry, including wedding rings, makeup, or hairspray. Do NOT bring valuables (rings, wedding rings, watches, earrings, necklaces, hair clips, hairpins, etc.) with you to TVEC. Do NOT wear makeup, perfume, or hairspray. You may wear acrylic nails with only light colored polish. If your nails are natural, we prefer you remove your polish. Do NOT drive until cleared to do so by your surgeon. 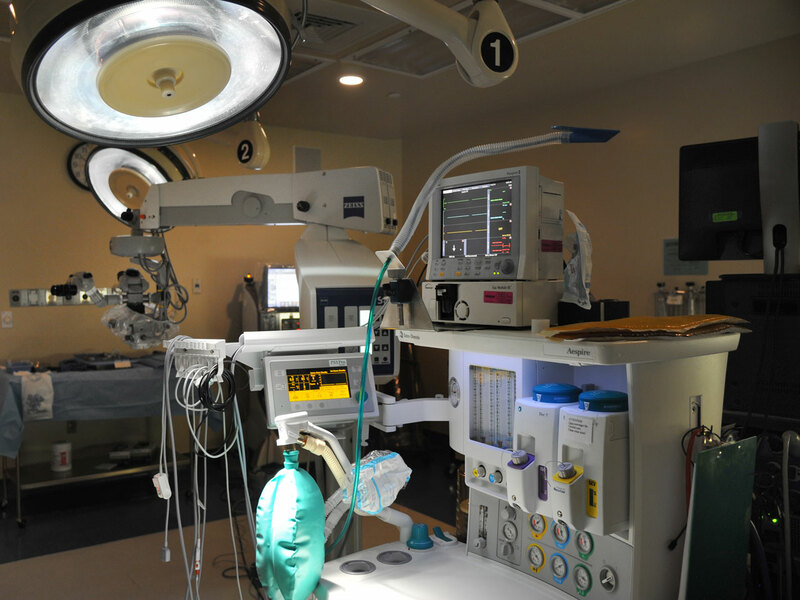 You will relax in the pre-operative area until the nurse assigned to care for you during your surgery takes you to the operating room. The doctors, nurses, and technicians will be wearing surgical masks, gowns, and gloves. The room will be filled with surgery equipment. Most patients having eye surgery will be awake during the entire surgery but their eye will be numb. You will hear the staff talking and working. Your doctor may also request that music be playing in the operating room to help you relax. Immediately following your surgery, you will be taken to a recovery area where the nurse will closely monitor your blood pressure, pulse and breathing. Medications for pain and nausea will be given if needed. You can expect to stay in the recovery area from 15-30 minutes, on average. This time will vary depending on the type of anesthesia you have and also depending on your doctor’s instructions. One family member will be able to sit with you in the recovery area until you are ready to go home (please limit to 1 person). You will be given a snack and a drink before you are discharged. You will also be encouraged to empty your bladder if possible. Before you leave, the TVEC staff will review all your discharge instructions with you and your family. Please feel free to ask questions about your home care. We will assist you to your vehicle where a responsible adult must drive you home. You may not drive yourself home. You must also have someone to drive you to the follow-up appointment on the next day.